There are plenty of landscape contractors in Scottsdale and the surrounding cities. How do you know which one sits above the rest in terms of a of style design, functionality, cost, and professionalism? The following is a list of some of the ways you can check out potential landscapers in Scottsdale. Unfortunately there are some fly-by-night companies out there. There are also scams contractors in Scottsdale and surrounding areas. Do your homework. A quick online search with the BBB will tell you if a landscaping contractor has an active license in the area and is registered with the BBB. It will also tell you their rating according to any complaints that have come in. You want a landscaper in Scottsdale who has at least a B+ rating with the BBB. You want a landscape contractor who offers upfront, clearly defined warranties for each type of service. If they do planting, how long will they come back to check on the growth? If they install an irrigation system, how long is that guarantee? In addition to ensuring your contractor has a license and does not have a pile of BBB complaints, you want him or her to stick around long enough to maintain the work. What service did you have? - You want to make sure it is relevant to the work you want done. If they had a pool installed and you are having an outdoor kitchen installed the type of work may be so different that it does not speak to how the landscape contractor will handle your project. Was it done on time? - Contractors of any kind often have a hard time sticking to a schedule. You want one who has enough integrity not to hold your yard hostage while he or she takes another job, leaving your home half-done until he or she comes back. Was it done on budget? - You want a landscaper who knows how to accurately estimate the costs. Some landscape contractors will under estimate to get the job, and then ratchet up the cost as they go along. A reputable professional knows how much your project will cost and is upfront about it. Get it in writing! Did you like the end result? Would you recommend this landscape contractor? Landscaping is a wonderful way to enjoy your own outdoors space. Make sure it is done by someone reputable who has the experience to do it right and is also dedicated to good customer service. 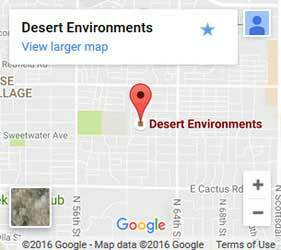 Feel free to ask questions about Desert Environments landscaping contractors in Scottsdale, Paradise Valley, and the Phoenix area.